Happy summer. I just got my first summer read on my table and am excited to get into it. Since the summer is a great time to sink into a good book, it made me think about all the great books I have read about ending binge eating. These books are supportive and encouraging, especially when you feel like you do not know what else to do and you are frustrated: bathing suit doesn’t fit, you are embarrassed to go outside, or you don’t know how to stop overeating. This list is not exhaustive, but it is a great starting spot to look at how to end emotional eating. 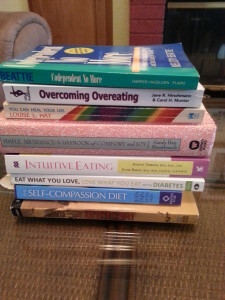 Be aware that these books do not all deal with eating issues, some deal with related issues like: codependency, self compassion and self care. I know, this is not a book about emotional eating. I recommend this book because many people who binge eat also engage in codependency. The term codependent emerged out of the addiction field, but believe me it’s meaning affects others who have not come from addiction. To me, codependency is: Giving up yourself for someone else. You don’t do what you want or know to be true because you do not want to make waves. Check out this book to get a handle on relationship issues when you feel like you give too much. No book list on emotional eating, in my opinion, would be complete without a spot for Geneen Roth. Truly all of her books are powerful and helpful. She weaves stories about the obsession with food with humor and seriousness. Anyone who is concerned about their binge eating can find comfort in her writing and her understanding. You are not alone. I know this book has the word diet in the title, but it is anything but a diet in the traditional sense of the word. Jean Fain is talking to the folks who are weary of another weight loss diet. She suggests self-compassion is the answer to a more healthy look on food and weight. She knows not everyone will like her idea, since it is not laced with a quick fix scheme. She walks the reader through how to engage in loving kindness and to love yourself into eating in a different manner. Anyone struggling with emotional overeating will do themselves a world of good by looking at self compassion as an antidote. I like this book because it was written by a family physician (Michelle May) and a certified diabetes educator and dietician (Megrette Fletcher). They provide thoughtful education about diabetes that even a novice can understand. They provide information to help people with prediabetes and with diabetes to understand mindful eating in a way that fits for their circumstance. This book is a day by day look at life, and can help you on the road to taking better care of yourself. It is a great way to start the day contemplating a new idea. You can start on January 1 or on whatever day you start the book. It was written a while ago, but the concepts are still relevant today. How do we slow down and really appreciate life in a simple manner is a universal idea. The daily reflection is a nice way to start the day, and they are short but powerful lessons. Simple abundance helps you look at how to live more simply with your money, clothing, and even food. 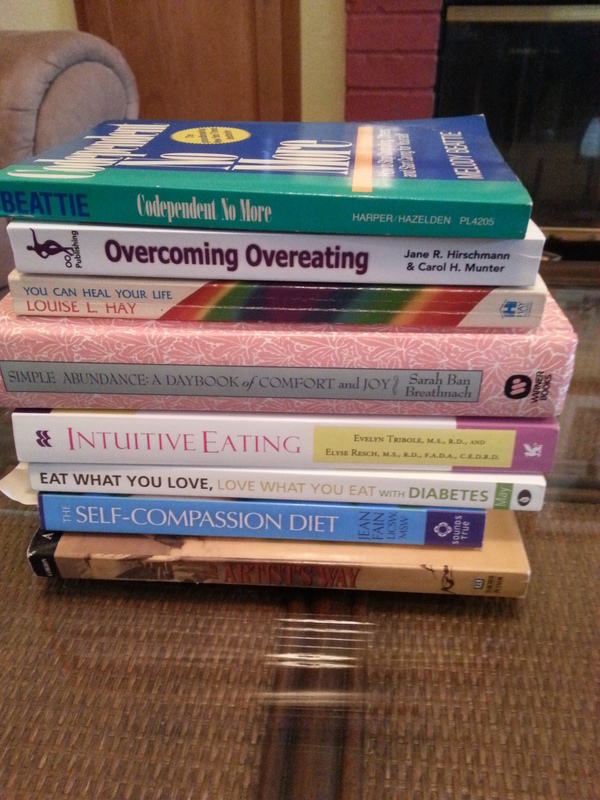 7) Intuitive Eating 3rd Edition- Evelyn Tribole, M.S., R.D., and Elyse Resch, M.S., R.D., F.A.D.A., C.E.D.R.D. This book has been revolutionary for me and my clients. The concepts invite the reader to stop dieting, because it does not work over time. The writers are Registered Dieticians who found their binge eating clients were losing weight initially, but gained the weight back. This sent them looking for what really works to end binge eating for good. Their work has been studied and verified by Tracy Talka, a University researcher. I really do like Geneen Roth and her books. She has specific ideas for her readers to follow to help them stop compulsive eating. This book helps you get at the root cause of compulsive eating in a way that is powerful and she tells it through her own story and the story of others. I recommend this book and its teachings often to my clients. You do not have to be an artist to gain value from this book. Julia has some practices that I think are instrumental in changing a person’s life around. One skill she encourages is the Morning Pages, which I recommend often. Don’t know what Morning Pages are? Get the book and find out- it is worth it. This book was published in 1988 and revised in 2010 and the concepts still hold true. What would it be like to stop overeating and not battle with food again? They present some concrete tasks: how to recognize fullness, noticing the thoughts connected to food, and many more. Looking for a book to stimulate your thinking this summer and help you feel better about yourself? Consider getting one of my top 10 books. I think you will find these books easy to read and packed with helpful ideas. Which books do you like? What is on your “to read list?” Let us know below. I would love to hear your ideas. Kim McLaughlin is a motivational coach who helps people break free from emotional eating.